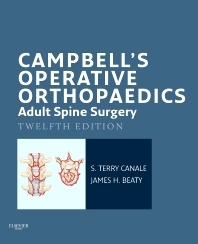 Now available for the first time - a convenient eBook on adult spine surgery from Campbell's Operative Orthopaedics, edited by Drs. S. Terry Canale and James H. Beaty! Load it onto your mobile device or laptop for quick access to world-renowned guidance on adult spine surgery from the experts at the Campbell Clinic. Achieve optimal outcomes in adult spine surgery with practical, high-yield chapters on Anatomy and Approaches • Fractures and Dislocations • Arthrodesis • LBP / Intervertebral Discs • Infections • and Other Disorders. Vividly visualize how to proceed with 3 surgical videos, plus a wealth of completely new step-by-step illustrations and photos especially commissioned for this edition. Depend on the authority of Campbell's Operative Orthopaedics - the most trusted and widely used resource in orthopaedic surgery, authored by Drs. S. Terry Canale, James H. Beaty, and 5 other authorities from the world-renowned Campbell Clinic.